Granville Wilbur Hamner was my great grandfather. I volunteered to write this article so I could learn more not only about him as a player but as a person as well. The first thing I learned was that he hated the nickname “Granny”. When it came to nicknames his preference was the name his family referred to him by, “Ham”. Out of respect for my readers I’ll stick with Granny. Hamner was a quiet kid from the streets of Richmond, Virginia. He attended Benedictine high school and loved playing sports both inside and outside of school. When he wasn’t playing sports he sang as a member of his local church choir. He met and married Shirley (my great grandmother) at a very young age and she remained his best friend until the day she died. The two of them would spend every Sunday off the field having a cup of strong black coffee and doing the New York Times crossword puzzle together, always trying to expand their vocabularies. When Shirley died, their daughter Pat assumed the role of Granny’s crossword partner. Like many public figures, there were sides of Granny Hamner. There was Granny – all about baseball, big cities, the fans, writers, managers, injuries, slumps and pressure. The other man was “Ham”. Ham prioritized home, Shirley and his children, family, friends, fishing, hunting and relaxing. I would have loved to have met either side of my great grandfather, but I find solace in knowing the legacy of Granny lives on in Phillies history. Granny Hamner was not the only one in the Hamner family pursuing baseball – his older brother Garvin Hamner was after the same dream. Much like Granny, Garvin loved baseball and most times you could find them together in the street or a local sandlot playing with other neighborhood kids. Garvin made it to the Major Leagues even though he spent most of his time in the minors. 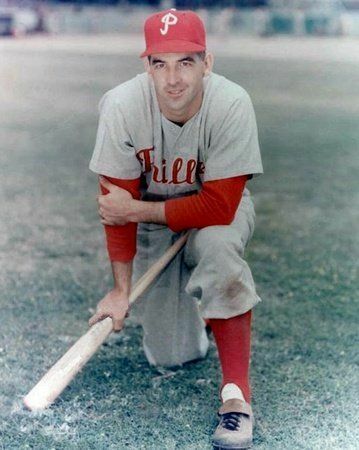 He would play next to his brother on the Phillies for 21 games in the 1945 season. Those were the only games Garvin would play in the Major Leagues. Granny Hamner was a shortstop who played 16 years for the Philadelphia Phillies. Hamner was the 6th Phillie ever to be inducted to the Phillies wall of fame and came in at number 64 on the Phillies Nation list of top 100 franchise players. Although he spent most of his time at shortstop he had the ability to play all over the diamond. He would even appear as a pitcher over the course of his career. He was a 3-time All-Star and was part of a Phillies team that is considered one of the greatest in team history. While his numbers wouldn’t jump out as “Hall of Fame” worthy it doesn’t take a genius to see he was a great ball player. Hamner was an almost automatic .260+ hitter, he regularly would rack up over 150 hits over the course of a season with less then 50 strikeouts (with one exception; 1952). He played in 1,531 games and finished with 1,529 hits, almost a hit per game, something that every body would love to have on their team to this day. But what Hamner was really good at was playing the field. He posted a career .955 fielding percentage. From the 1944 season until the 1947 season Granny only played in 39 games for the Phillies and struggled while he was with the team; switching numbers and moving to a new place on the diamond almost every time he was recalled. By the start of the 1950 season the Phillies looked like the team to beat and would be challenging for a title with a young core of Hamner, Ashburn, Ennis and Jones in the field backing up the two aces Robin Roberts and Curt Simmons. All under the age of 25, these six players formed the core of the Whiz Kids. They would go on to win 91 games and finish first in the National League. Hamner, in just his third full season, would play a career high 157 games and participate in the 1950 World Series. They faced the New York Yankees in just the second World Series appearance in team history (first one came in 1915 against the Boston Red Sox). The Yankees as always were lined with superstar players in the field. Highlighted by guys such as Yogi Berra, Phil Rizzuto and Joe DiMaggio; they were an offensive power house and swept the Whiz Kids. Hamner would never return to a World Series. Overall Granny Hamner should be remembered not just as one of the greatest Phillies of All-Time but as one of the greatest shortstops ever to play the game. I would like to give a special thank you to my aunt Pat Hamner-Ambrosius for her help with writing this article. I would also like to thank Brian Michael, Ian Riccaboni and my Mom for both knowingly and unknowingly assisting me with the article along the way.